Back in the day Arabs didn't have a civilization or a culture like Persians, Greeks, or Romans. They were nomad tribes fighting each other on grass and water. On the other hand they used to have exhibitions for poet, they will meet every year from all tribes every one with his master piece of poet that he was working on it all year long.. and at the end of the exhibition they will pick the best one and write it with gold ink on a piece of leather and hang it on the holy KAABA located in Mecca. All this before Islam. Arabic language is very romantic, poetic, and artistic language and so it'scalligraphy is very complicated and artistic containing very strong composition, structure or lines and curves.. 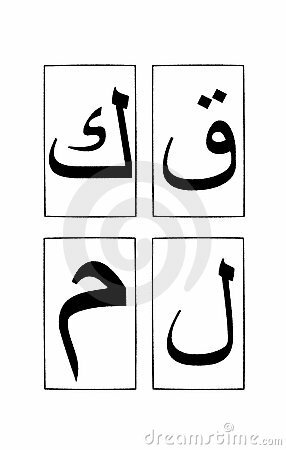 Here is an example of 4 letters... from down clockwise... L - M - K - "Que"
It is always a pleasure to learn of the traditions and cultures of others, thank you for sharing. Hi Omar I agree with you.